The study evaluated if opening the water control structures on these highly altered systems would improve natural systems and water quality in the channels and ultimately Old Tampa Bay. 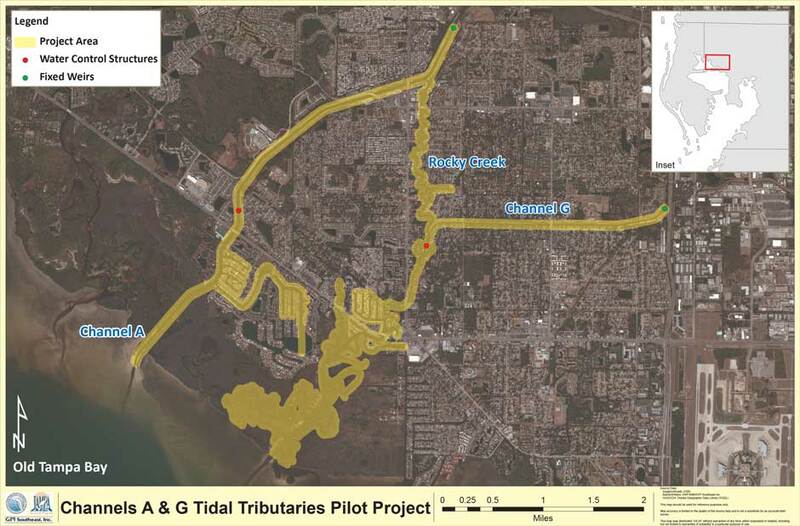 The District, in partnership with the Tampa Bay Estuary Program, conducted a pilot study on Channels A and G, located in northwest Hillsborough County (see map), to determine whether opening the channels’ two structures could improve natural systems and water quality in Old Tampa Bay. Unlike other areas of the bay, the water quality and seagrass coverage in Old Tampa Bay has not shown significant improvements. In addition, reoccurring algae blooms in the upper portions of Tampa Bay over the last few years have indicated the need for additional studies. As part of this study, the structures were opened June 20, 2014, and data was collected for two years to observe changes in the ecosystems along the channels, which empty into Old Tampa Bay. Opening the structures on Channels A and G allowed tidal flushing upstream and improved the water quality in this system as well as Old Tampa Bay. Water levels upstream of the water control structures are lower and fluctuate more frequently with the tide and rainfall events. Tidal fluctuations in water levels expose more channel bottom sediments during portions of the day. Water pumped directly from the channels increased in saltiness and therefore pose a risk to irrigation of lawn and plants around your home. It is recommended to stop using channel water for irrigation due to the risk of damaging plants that have a low tolerance for saltwater. Increased saltiness in the water above the water control structures changes the types of vegetation along the channels’ shorelines. Within the channels upstream of the structures, shoreline vegetation became more saltwater tolerant. This means that freshwater-only vegetation may die-off while the structures are left fully open. Saltwater-tolerant plants may appear on the shorelines upstream of the structures. Saltwater-tolerant plants provide critical nursery habitat to bay-dependent fish, crabs and wildlife. The opening of the structures alleviates periodic water releases during rainfall events and results in a more natural connection to greater Tampa Bay. Frequent tidal exposure of the sediments within the channels allows for a reduction of nutrients flowing into Old Tampa Bay. These nutrient-rich materials would otherwise discharge directly to Old Tampa Bay and pose potential problems downstream in greater Tampa Bay. Reduced nutrients in the water flowing from the channels into Old Tampa Bay increases the likelihood that the bay’s water clarity and quality will improve. Improved water clarity and quality in Old Tampa Bay can allow for underwater seagrasses to grow and expand, creating additional habitat for fish and wildlife in greater Tampa Bay. Without a restricted connection to Tampa Bay, the channels and Rocky Creek will better serve as prime nursery habitat for a variety of fish and wildlife common to Tampa Bay. Oysters and barnacles may be able to move upstream into the channels, which help filter nutrients out of the water. Bay-dependent birds and animals, such as dolphins and manatees, are able to forage in areas upstream of the open structures. The study period of opening the water control structure’s gates began on June 20, 2014, and the first-year monitoring report and the second-year monitoring report are both available. The District continues to leave the gates open in order to study long-term changes in the Channels A and G system. Contact Nancy Norton, senior professional engineer, at 1-800-836-0797 (FL only), ext. 2203.